"A small application for uninstalling DirectX 9.0." DirectX is a group of technologies from Microsoft that were developed in order to make computers running the Windows operating system an ideal platform for running and displaying applications that are rich in multimedia elements and content including, but not limited to rich audio, full-color graphics, 3D animation, and video. DirectX also included several security updates and performance updates, new features, and technologies that are accessible using the DirectX APIs. 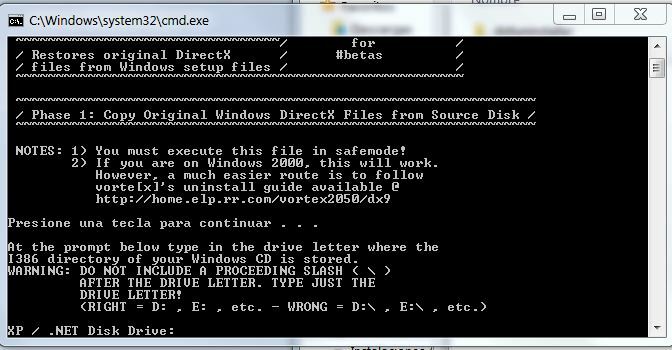 DirectX, hasn't always been the most fun thing to deal with though, hence why there is a dedicated DirectX Uninstaller application. Several programs have not yet been optimized to run alongside DirectX properly and crashing became a very common thing. Installing DirectX is rather simple though. Just like any other Windows .exe file, DIrectX can be downloaded from the internet and installed on any compatible PC and operating system. Unstalling the application, however is a pain. Luckily for us, Microsoft didn't want to make it completely impossible to remove DirectX from your PC for whatever reason one may need to do so. They provided us with the DirectX 9.0 Uninstaller application for that very obvious reason. The application takes the pain and headache away from uninstalling DirectX and just gets the job done, no questions asked. It works like any other Microsoft Windows .exe file. Simply double click or right click and open the application to get started with the uninstallation process. Once it is complete, DirectX will no longer be installed on your computer and your applications that were not compatible will once again run flawlessly.